In addition to manufacturing their own professional quality drums and traps in house, George B. Stone & Son Inc. catalogued instruments and accessories purchased from other companies. This is very apparent in Catalog K dating from 1925 where many Deagan keyboard instruments are included as top of the line offerings. This particular arrangement with Deagan may have had something to do with Advertising Manager F. W. Neptune, formerly of J. C. Deagan. Also available through Stone & Son for many years was Ludwig & Ludwig's early bass drum pedal which proved to be so popular that it helped establish the Ludwigs' place in the market as their young drum manufacturing business grew. "Wells Manufacturing Company, Brooklyn - A very small shop employing three or four men who do not make an assembled product, but supply wood shells to other drum factories such as Duplex, Stone, and a few jobbers who make up cheap models." So perhaps this was the source of Stone's entry level drums distributed through the 1910s and '20s. The catalog page seen below further explains that these drums are of lesser quality and and are intended as budget level instruments. George B. Stone & Son Catalog G, ca. 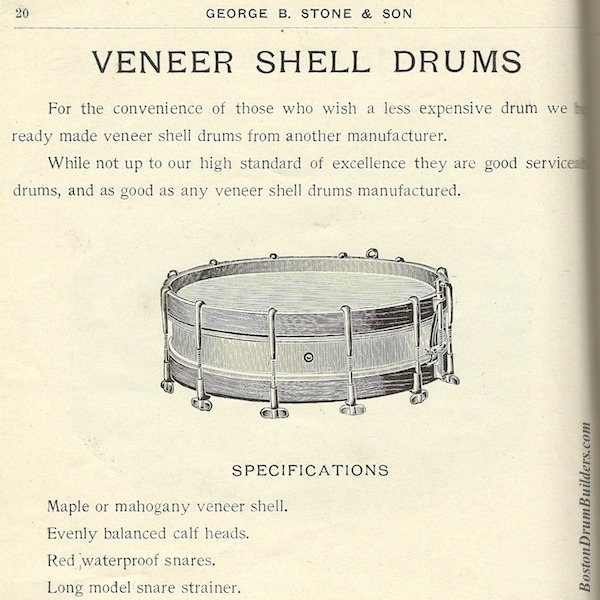 1915 It is also worth noting that just because a drum bears a strainer marked 'Stone', that the instrument may not neccesarily have been produced by Stone & Son. The "Stone Patent Snare Strainer and Muffler" was available for purchase separately and sometimes surfaces as an after-market addition to drums. These examples are not normally stamped with the Stone name so as not to confuse the make of the drum. All of this is to say that identifying a drum as having been built by Geo. B. Stone & Son relies on a number of different factors. To further muddy the waters, Stone sometimes assembled drums using what appear to be 'generic' parts. This was especially true during the very early 1900s before the company's hardware was unique to Stone, and in the 1930s by which time the manufacturing business was being allowed to fade. Stone was generally very good about labeling their house made instruments and at times even date stamped drums as they were assembled. So in the absence of a manufacturer's badge or label, the best way to definitively identify a Stone drum is by looking at combination of characteristics and matching them up against known examples of factory labeled instruments. Do you have a drum made by George B. Stone & Son? I want to hear from you! Send Lee an email at lee@vinson.net.